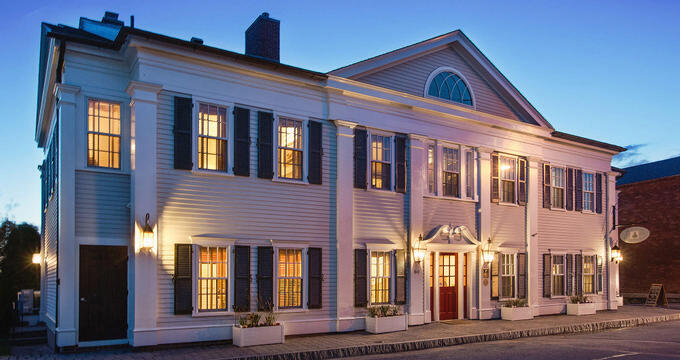 Located in the history-rich village of Stonington Borough, Connecticut, The Inn at Stonington is situated right on the Fishers Island Sound and the Atlantic Ocean, which is just a short walk away from award-winning shops, galleries, and restaurants. Guests find comfort in the many amenities and unique services the Inn and the surrounding area provide. The accommodations at The Inn include 18 different rooms in a single inn building. Most of the guest rooms have views of the seaside Stonington Harbor and the Fishers Island Sound. The other rooms are considered the village side. Guests should make sure to state their preference when reserving a room. All rooms can be virtually toured on The Inn’s website ahead of making reservations as well. The rooms either a queen-sized or a king-sized bed, except for Room 15 (this room has two full sized beds as well as a larger living room area). Many of the guest rooms also feature walkout balconies and window seats. Travel and Leisure Magazine features The Stonington Inn's Room 7 as one of the most unique, modern luxury suites in Connecticut. Rooms 14 and 15 can be joined if requested. All rooms at The Inn are non-smoking. Not all the rooms at The Inn are accessible to those with physical disabilities. Room 4, located on the first floor, is accessible and has its own entrance/exit door. Many of the rooms at the inn have different amenities to enjoy. Some of the rooms and suites have gas fireplaces and other cozy amenities. Each bathroom features a separate Jacuzzi soaking bathtub and shower (apart from rooms 2 and 4, that do not have Jacuzzi bathtubs, and rooms 10, 11, and 12, that only have oversized soaking bathtubs with Jacuzzi jets). Each bed is fitted with high-quality bed linens and comforters. Each room has an ironing board and iron. The bathrooms have luxurious robes for guests to use while staying at The Inn, hairdryers, and EO brand shampoo, conditioner, and body soaps in the shower dispensers. Each guest rooms have complimentary wireless internet access, a flat screen television, and the use of Google Home technology. Room 16 features its wet bar. Each overnight stay comes with a complimentary wine and cheese reception in the evening and free breakfast the next morning. Parking is included, as well as water and soft drinks. The concierge desk staff provides exceptional hospitality to Inn guests. Guests with any specific request, whether for a bottle of wine, help to select a local restaurant to dine at, directions, or anything else. The staff can also help guests pack picnic lunches, organize bourbon tastings, or arrange a private charter boat. Give the desk 24 hours’ notice to arrange larger requests. The Inn at Stonington takes a holistic approach to health and wellness. Certified massage therapists provide on-site massage therapy to guests staying at The Inn. There are two massage rooms located just steps away from the guest rooms, each designed for tranquility and comfort. The massage therapists will meet with each guest before their appointment to establish the best plan and course of treatment. Reservations are recommended. Massages will last either an hour or an hour and a half. The Inn at Stonington also has a fitness room. This room offers guests the ability to work out while on vacation and has a selection of both cardio and strength training equipment including an elliptical, a spin bike, a universal weight machine, free weights, and a rowing machine. Located just steps from The Inn are a variety of both hiking and biking trails as well. Trail information is available on the website as well as by contacting the concierge desk. While there are no dining options at The Inn other than the complimentary continental breakfast, there are a wide variety of award-winning restaurants located just walking distance away. The closest is the Breakwater, located just in The Inn’s backyard. Breakwater offers locally caught, fresh seafood dishes, a full bar, and both inside and outside dining. The staff at The Inn recommends the fish tacos. For a more casual experience, guests can dine at the Dog Watch Cafe. A favorite of many of the Stonington locals, the menu is fast, casual American food with an east coast twist. Inn staff recommends the lobster BLT. Guests who enjoy Mexican food can dine at Milagro. The chef was born in Mexico City, and he offers an authentic menu including cinnamon and honey margaritas and ceviche de atun.